Sun Tour's below-the-bar shifter, similar to Rapidfire Plus ®. When an object is bent so far that it does not spring back to its original shape when the stress is removed, it is said to yield. Under the rules of the road, to yield right of way means to allow another vehicle (including bicycles) to proceed. There is a simple set of rules describing every type of encounter, in which one must yield so the other may proceed. A fitting used on centerpull caliper and cantilever brakes which use a transverse cable. The yoke is the part that connects the main cable to the transverse cable. This is frequently misspelled as "yolk", which is part of an egg. That is not a good yoke! An electronically-shifted rear derailer made by Mavic. A plastic fastener primarily intended for bundling electrical wiring together, but also very useful for securing cables and other items to bicycles. 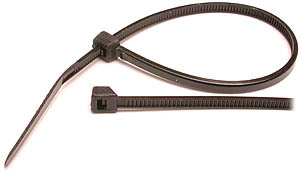 A zip tie consists of a toothed plastic strip with a one-way ratcheting hole at one end. You slide the plain (usually pointed) end of the ziptie into the hole and can pull it tight, but it will not loosen up. 4th hand tools are particularly useful for securing zip ties. For bicycle applications, avoid using white/clear zip ties, because they are liable to deteriorate due to exposure to ultraviolet radiation when used outdoors. A brand of aftermarket fairings. made of transparent plastic. A common model clips to the brake-lever hoods of drop handlebars and provides a modest increase in speed, while also keeping the hands warmer in cold weather and providing some protection against bugs and rain.. Zzipper also makes fairings for recumbents. There is some increase in road noise, because the fairing acts as a sounding board. Thanks to Jobst Brandt, Jeff Del Papa, Mark Irving, John McMillan, and Drew Saunders for their helpful suggestions.